William "Bill" Jeffrey (August 3, 1892 – January 7, 1966) was the head coach of the 1950 United States World Cup team that famously beat England 1-0 in one of the greatest upsets in the history of soccer. He was the coach of Penn State for 26 seasons, winning ten national college championships. He is a member of the National Soccer Hall of Fame. Jeffrey began playing at an early age, but suffered a career-ending injury. His mother sent him to live with an uncle in the United States. 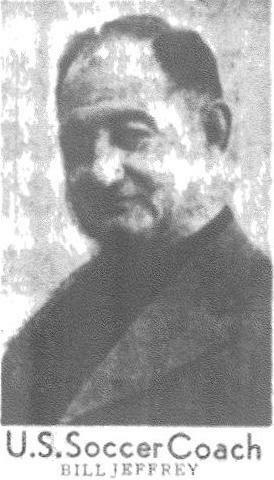 He began working as a mechanic with the Altoona Railroad Shop of the Pennsylvania Railroad. He eventually came to manage the company team. In 1925, his team played an exhibition game with Penn State University. This resulted in an offer to coach the men's soccer team, a position he held for 27 years. Beginning in 1932, the Nittany Lions would go on a 65 game unbeaten streak, a streak which ended in November 1941. In 1953, he retired from Penn State and moved to Puerto Rico where he taught and coached for several years. On September 29, 1972, the Penn State soccer stadium was named after Jeffrey. A founding member of the NSCAA, he served as president of the association in 1948. The NSCAA awards the annual Bill Jeffrey Award to college coaches. 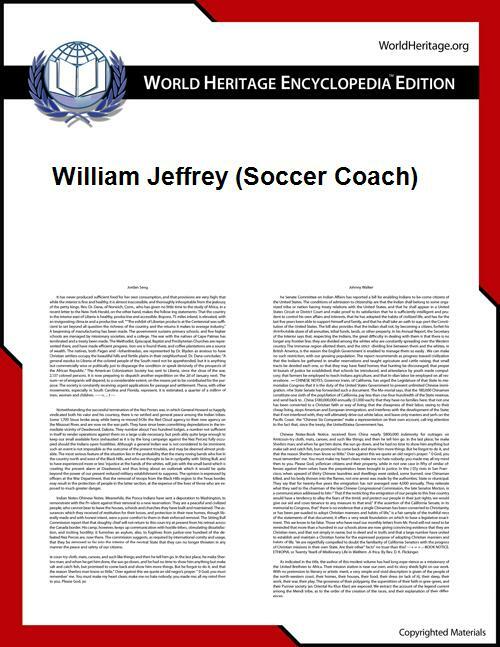 The United States Soccer Football Federation selected Jeffrey to coach the United States men's national soccer team at the 1950 FIFA World Cup just two weeks before the competition after Erno Schwarz declined the position. Jeffrey led the U.S. team to its historic 1-0 win over England in the 1950 World Cup, considered one of the greatest upsets in soccer history. He died of a heart attack while attending the NCAA soccer meetings in New York. He is buried in Centre County Memorial Cemetery in State College, Pennsylvania.